February 20, 2019, 5-7 p.m.
Join us for this talk highlighting two ways of looking at Monhegan island’s artistic community: from the personal perspective of private collectors and from the historical vantage point of the Monhegan Museum. Leith MacDonald, an artist and arts administrator, will examine key works in a private collection devoted to Monhegan art assembled by two Maine residents. That collection is featured in his recently published book, Island Inspiration, Monhegan’s Art Colony, 1895-2000. Jennifer Pye, curator of the Monhegan Museum, will discuss the museum’s holdings and its relationship to the island community. She recently organized the exhibition The Monhegan Museum, Celebrating Fifty Years 1968-2018 and contributed to the catalog. A reception will follow, celebrating the work of contemporary Monhegan artist Alison Hill, whose work will be on view at Elizabeth Moss Galleries, located at 251 U.S. Route 1, in Falmouth. For more information, call 207-781-2620. Lynn Drexler, Rocks, 1979, 34"x37", oil on canvas. Courtesy of Elizabeth Moss Galleries. The Monhegan Artists’ Residency announces the opening of the application period for summer 2019 grants on Monhegan Island, Maine. The program provides studio space, comfortable living quarters, a modest stipend, and time for visual artists to reflect on, experiment, or develop their art and ideas while living in an artistically historic and beautiful location. The application period runs from February 1st through March 17th and is open to all artists with significant ties to the state. There will be two 5-week grants, one in June and another in September; as well as a 2-week grant in July designed for artist-teachers (grades K-12) who work in Maine. For further information on the application process and past recipients, visit monheganartistsresidency.org, and link to Submittable, an online submission service. The jurors for 2019 applications are photographer Margo Halverson, chair of the graphic design program of the Maine College of Art; the Portland painter and art instructor John Knight; and Rockland-based artist and arts administrator, Leith MacDonald of the Farnsworth's Wyeth Study Center. Artists in all visual media, including painting, drawing, sculpture, photography, printmaking, digital, video, or other new media are encouraged to apply. Successful applicants will be notified by April 15th. A panel of Maine art professionals recently selected three artists to participate in the 2018 summer residency program on Monhegan Island: weaver Sarah Haskell from York, printmaker Jude Valentine from East Machias, and educator and painter Raegan Russell from South Berwick. Sarah Haskell is a textile artist who works with thread in many forms. Prior to her residency time on Monhegan, she intends to weave and “weather” ground cloths, which she will then embellish on island. She will “use the time to stitch, hem, knot, and embroider” and will also “expose additional pieces of hand woven cloth to site specific environmental elements,” while observing “the forces of nature at work, not only on my handwoven/stitched cloth but … ultimately on me.” Haskell is a graduate of the Rhode Island School of Design and was recently awarded residencies at the Vermont Studio Center and the Hewnoaks Artists’ Colony. Jude Valentine creates landscape monoprints in a process through which she draws and paints directly on polymer plates while outside in the landscape. She sees her prints as revealing “elements of landscape,” while being “densely layered with an energetic animism of line and limited color.” Valentine holds a BFA from the Maine College of Art and MFA from the Vermont College of Art, and is an Assistant Professor at the University of Maine, Machias. She was a 2017 Artist in Residence at the Joseph A. Fiore Art Center. Raegan Russell is the Visual Art Department Chair at the Berwick Academy in South Berwick, Maine and will be participating in the 2-week K-12 art teachers’ residency. She looks forward to being inspired by the beauty of Monhegan and sees her paintings as a way to “hold on to the ephemeral and to explore the changing landscape and its forms.” Russell received a BFA and MFA in painting from Boston University, and is currently on sabbatical in South East Asia. The jurors this year included Kathryn Jovanelli, museum administrator at the University of Maine Museum of Art in Bangor; Henry Wolyniec, Portland artist and former studio manager at Space Gallery; and painter Nathaniel Meyer, a Monhegan residency recipient in 2015 and art teacher in the Lewiston High School. All three were impressed with the varying concerns for the natural world apparent in this year’s applications and their inventive modes of expression. Since 1989, the Monhegan Artists’ Residency has supported the creative growth of dedicated Maine artists by providing them time and space in which to work free of interruption and constraint in the inspiring environment of Monhegan Island. For well over 150 years, the island has inspired countless artists, such as Robert Henri, George Bellows, Rockwell Kent, and Jamie Wyeth. While Monhegan continues to attract artists from around the world, it is increasingly difficult for Maine artists to find affordable housing for an extended visit on the island. To this end, the Monhegan Artists’ Residency provides free housing, studio space, a weekly stipend, and time for visual artists to reflect on, experiment, or develop their art. Three residencies are offered each summer for artists with strong connections to Maine: two 5-week sessions, and one 2-week session specifically for K-12 visual art teachers. At this collaborative PechaKucha-style event, a group of former Monhegan Artists’ Residents, including this past summer’s residents, each presented a slideshow of their work. Presentations included highlights from their experience creating work on island and how the experience has informed their current studio practice. Presenting artists included: Meg Hahn (2017), Cory Bucknam (2017), Maia Snow (2017), Nathaniel Meyer (2015), Kenny Cole (2012), John Knight (2001), David Vickery (1993) and Michael Branca (2003). Presented in partnership with the Farnsworth Art Museum. MONHEGAN—The Monhegan Artists’ Residency Corporation (MARC) is pleased to announce that it is now taking applications for its 2018 summer program. Two 5-week residencies are available to Maine-based visual artists during the weeks of May 26 to June 29, and September 11 to October 16. There is also a 2-week residency for a Maine art teacher (grades K-12) from June 30 to July 13. Applications are being accepted online through Submittable.com from February 1 through March 17. For well over 150 years, Monhegan Island has inspired countless artists and continues to attract contemporary artists to its unique coastal island landscape. MARC keeps this tradition alive and well by providing housing, studio space, and a weekly stipend to its artist residents. Not just for landscape painters, the residency is open to artists working in new media, photography, sculpture, drawing, painting, and multi-media. For more information about the program, its past residents, and applications details, visit monheganartistsresidency.org. This year’s applications will be reviewed by a panel of three jurors: Kathryn Jovanelli, Assistant Director, University of Maine Museum of Art, Bangor; Henry Wolyniec, artist and building manager, Space Gallery, Portland; and Nathaniel Meyer, artist and teacher, Lewiston High School, Lewiston. Founded in 1989 the Monhegan Artists' Residency is a volunteer-run 501(c)3 nonprofit supported by donors, art galleries, corporate sponsors, and foundation grants. PORTLAND, ME -- Three Monhegan Artists' Residency alumni - Krisanne Baker, Maia Snow, and Victoria Statsenko - recently opened a show of their paintings at the Avon Street Gallery in Portland on Saturday, November 18. The artists have all previously participated in the Monhegan Artists' Residency. Each spent a month on Monhegan Island where they were given an apartment and studio, a stipend, and the freedom to work as they wished. The residency is awarded annually to artists who are selected by a rotating jury. Susan Danly, president of the nonprofit Monhegan Artists' Residency, attended and spoke at the opening on November 18. The show runs through December 16. Avon Street Gallery is located at 11 Avon Street in Portland, Maine. For further information, please contact Jan ter Weele of Avon Street gallery at 207-536-4979 or jtwpaintings@msn.com. Painting & Photography: An Alliance of Mediums reflects the deep connection her painting has to her photographic work and underscores the broader dialogue and influence that exists between these two disciplines. A selection of Hauser’s paintings (many of which began during an immersive five-week residency on Monhegan Island) have been transformed into large groups of ziatype, cyanotype and gum bichromate prints as part of her ongoing Album Series. Hauser’s Album Series amplifies the power and complexity of the print medium by creating compositions that rely on an interplay of pictorial structures between variant prints of the same image. Her intention, through the reiteration of a single image, is to echo the inherent rhythms of the natural world—time in particular—not one moment in time as a single photograph captures; instead, Hauser elects to express the nonlinear way in which we recall time, its relentless repetition and endless variation. The Monhegan Artists’ Residency Corporation has announced their choice of three Maine artists for the 2017 summer residency program on Monhegan Island: Meg Hahn and Mia Snow, who are both painters and recent graduates of the Maine College of Art, and Cory Bucknam, a Gifted and Talented Art Teacher at Brunswick Junior High School who creates abstract ceramic pieces. 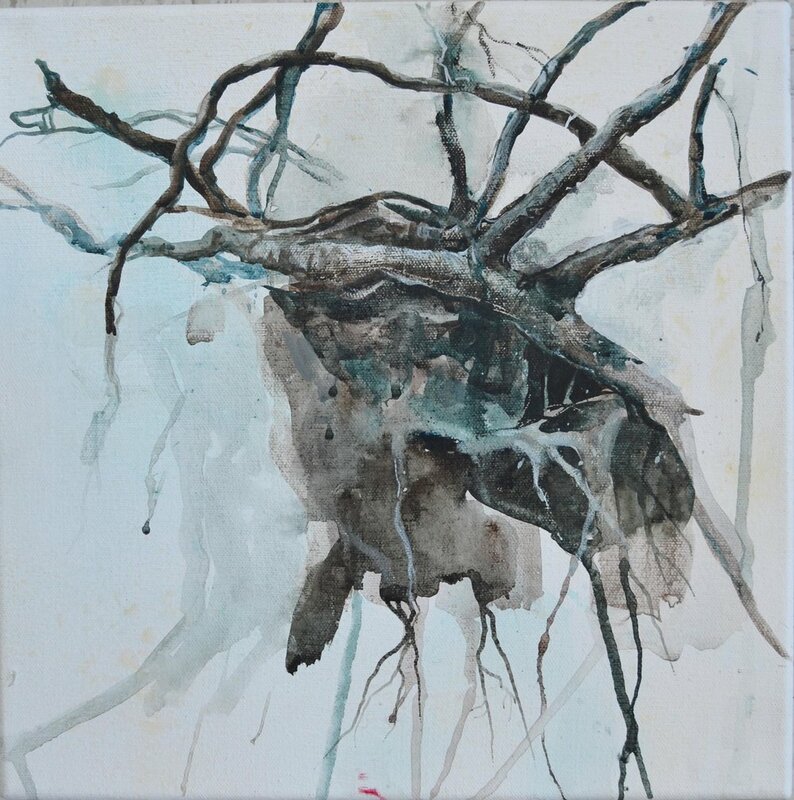 Hahn and Snow will spend five weeks in June and September, respectively, and Bucknam was awarded the two-week residency in July, recently established for artist-teachers who serve the K-12 grade levels in Maine. The three were selected by a jury that included Chris Stiegler, curator, art historian, and chair of the MFA in Studio Art at the Maine College of Art, Portland; Hilary Irons, artist, and co-founder/curator of Able Baker Contemporary, Portland; and Kelly Finlay, a Monhegan Artists’ Residency board member and public programs manager at the Farnsworth Art Museum, Rockland. Saturday, January 28, 2017 at 1:00 PM at the Farnsworth Auditorium. In this collaborative lecture program, three artists who participated in this past summer’s Monhegan Artists’ Residency will each present a slideshow presentation of their work, including highlights from their experience creating work on island. Susan Danly, President of the Board of Directors of the Monhegan Artists’ Residency, will also share some of the Residency’s history and its mission in supporting the creative growth of dedicated Maine artists by providing them time and space in which to work in the inspiring environment of Monhegan Island. The three artists include Barbara Sullivan of Solon who makes fresco reliefs of everyday objects; Krisanne Baker of Waldoboro who creates multimedia environmental arts on behalf of water quality, availability, and rights; and Michelle Hauser of South Thomaston who explores natural events that tilt Maine’s landscape into abstraction using painting, photography and a convergence of both mediums. Following the presentations there will be an opportunity for Q&A. Advance tickets are also available for sale in the museum store or main lobby admission desk. We are pleased to announce our 2016 residents! Barbara Sullivan from Solon (June) makes fresco reliefs of everyday objects. Krisanne Baker from Waldoboro (July) creates multimedia environmental arts on behalf of water quality, availability, and rights. Michelle Hauser from Rockland (September) creates abstract painting and photography. Congratulations! And thanks to all the wonderful applicants for submitting work. Applications are being accepted for the Monhegan Artists’ Residency for Maine artists. In addition to two five-week residencies on Monhegan Island for Maine-based visual artists, the program offers a two-week residency for a Maine art teacher. “Thanks to the generous support of individual donors, the Horizon Foundation, the Maine Community Foundation, and other charitable organizations, we are again able to support three residencies this year,” said Susan Danly, chair of the Monhegan Artists’ Residency Corporation (MARC) board of directors. The application deadline for all three residencies is March 15, 2016. This year applications for the residency program are being accepted on-line only. For guidelines, a history of the program, and a list of past residents, visit monheganartistsresidency.org. Applicants will be notified by April 15th of the jury’s decision. The residency program provides living quarters, studio space, and a $150 per week stipend. The two 5-week residencies run from May 28-July 1 and September 3-October 7. Only Maine residents are eligible to apply. The two-week Maine art teacher residency runs July 2-15 to accommodate the school-year schedule. The residency program is aimed at visual artists working in painting, drawing, printmaking, photography, sculpture, or the digital arts. An important goal of the program is to enhance the careers of serious artists who have yet to gain wide recognition. Quality of work is the primary criterion for selection. The jury of art professionals this year includes MARC board member and artist Sissy Buck, Polly Saltonstall, editor of Maine Boats, Homes, & Harbors and noted collector of contemporary Maine art, and the artist Duncan Hewitt, whose retrospective exhibition is currently on view at the Portland Museum of Art. Previous Monhegan artist residents include Sarah Knock, Marguerite Robichaux, David Vickery, Lynn Travis, Joe Kievitt, Jim Dugan, Karen Adrienne, Kenny Cole, Jan ter Weele, and Justin Richel. Founded in 1989, the Monhegan Artists’ Residency program is a volunteer-run 501(c)(3) nonprofit supported by donors, art galleries, corporate sponsors, and foundation grants. PORTLAND— Three artists with significant ties to Maine have been selected as the 2015 recipients of the Monhegan Artists’ residency: Coreena Affleck (Yarmouth), Justin Richel (Rangeley), and Nathaniel Meyer (South Portland). Affleck and Richel will benefit from five‐week sojourns on Monhegan Island, and Meyer has been awarded the two-week residency for Maine K–12 art teachers, which was added to the program three years ago. This year marked the first time that the Monhegan Artists’ Residency (MARC) was opened up to artists at all career levels, which brought in a 30 percent increase in applications. The jurors for 2015 were Bruce Brown, collector and former curator at the Center for Maine Contemporary Art; artist Lauren Fensterstock; and Laurie Perzley, Fine Art Director and Curator at Thos. Moser Gallery and MARC Board Member. “It took many hours to come to a decision given the high quality of applicants,” says Brown. Three Maine artists have won the right to walk in the footsteps of Robert Henri, Edward Hopper and Rockwell Kent. Coreena Affleck of Yarmouth, Justin Richel of Rangeley and Nathaniel Meyer of South Portland have been selected as the 2015 recipients of the Monhegan Artists’ Residency. Affleck and Richel will spend five weeks on Monhegan, and Meyer was awarded a two-week residency for Maine K-12 art teachers. A dozen miles off midcoast Maine, Monhegan has attracted artists since the mid-1900s. It remains a destination for artists, but the high cost of housing makes it unaffordable for many beyond day trips and overnight visits. The residency allows artists to work on Monhegan for extended periods. The jurors were Bruce Brown, a collector and former curator at the Center for Maine Contemporary Art; artist Lauren Fensterstock; and Laurie Perzley, fine art director and curator at Thos. Moser Gallery and a residency board member. They selected a multimedia artist in Affleck, a painter, printmaker and ceramicist in Richel, and a painter in Meyer. The residency provides artists with time and space to work free of interruption and constraint. Since its founding in 1989, the organization has sponsored more than 50 artists. Read the full Article on Portland Press Herald’s website. Artists include: Karen Adrienne, Daniel Anselmi, Susan Bennett, Michael Branca, Melinda Campbell, Kenny Cole, Cynthia Davis, Nicole Duennebier, Jim Dugan, Kristin Maria Fitzpatrick, Wes Freese, Alina Gallo, Mercedes Gilbert, Eileen Gillespie, Kelli LK Haines, Mary B. Harrington, Connie Hayes, David R. Higgins, Terry Havey Hilt, John Knight, Sarah Knock, Margaret Leonard, David Little, MaJo Keleshian, Janet Conlon Manyan, Betsy McLellan, Martha Mickles, Marguerite Robichaux, Carol Sloane, Michael J. Smith, Lynn Travis, Emily L. Trenholm, Michael E. Vermette, and Ryan Wight. Jan ter Weele, the last of this year’s MARC residents currently has a show at the George Marshall Store Gallery in York. Carver Hill Gallery is pleased to welcome Daniel Anselmi to our gallery with a solo show on First Friday, September 5, 2014. The show will feature Anselmi’s pieces from a residency on Monhegan Island, as well as a collection of larger paintings, collages and sculptures. The Monhegan Residency Program is a five week retreat for just two artists per summer, carefully selected from many applicants eager to have creative time on this beautiful island. Rockwell Kent, George Bellows, and the Wyeth family, to name a few, have been inspired by the quiet magic of this island. Daniel’s pieces from this residency are wonderful interpretations of his days spent there, and we are delighted to share them in this show. There is a strong architectural aspect of Daniel’s work that make these pieces very intriguing. His palette is typically earthy, very reminiscent of modernist colors and tones, with wonderful texture and depth. He uses found objects in his 2D and 3D work, but they are so skillfully incorporated into the piece that one might not even notice. The discarded paper, which can be old blueprints, ledgers, navigation charts, etc., is painted over with oil, and then arranged as one would apply different colors with a brush. “Though sourced materials are not intended to be recognizable in my abstractions, sometimes surface traces remain that become a moment of discovery for the discriminating viewer.” The re-appropriated objects in his sculpture seem perfectly planned – like happy accidents, they serendipitously support each other to keep from falling over. For more information, please visit Carver Hill Gallery. FREEPORT – Sarah Knock of Freeport is among the 34 artists featured in a 25th anniversary exhibition celebration of the Monhegan Artists’ Residency Program at the Thos. Moser Freeport Showroom, on 149 Main St. The ongoing exhibition continues through Oct. 14. Knock said the Monhegan Artists’ Residency was a “pivotal experience” for her. It supports emerging visual artists by giving them living quarters, studio space and a stipend to live and work on Monhegan Island for six weeks. Knock lives in Freeport with her husband, and is a full-time artist represented by Greehnut Galleries in Portland since 1990. Knock earned her bachelor of fine arts degree at Boston University in 1988 and was awarded the Monhegan Island residency in 1989. The Monhegan Artists Residency Program is pleased to announce the three recipients of the 2014 fellowships. Multi-media artist, Victoria Statsenko, who graduates from the Maine College Art in May, will be the island resident from May 31st through July 4th. The second artist-teacher residency from July 5th through July 18th was awarded to printmaker Scott Minzy, an art instructor at Erskine Academy in South China, Maine. Falmouth painter, Jan ter Weele, will be in residence on the island from September 6th through October 10th. The residency program is aimed at emerging visual artists working in painting, drawing, printmaking, photography, sculpture, or the digital arts. An important goal of the program isto enhance the careers of serious artists who have yet to gain wide recognition. Quality of work is the primary criterion for selection and the jurors for the 2014 application process were photographer and installation artist Elizabeth Atterbury; photographer Bryan Graf, who teaches at the Maine College of Art; and Monhegan watercolor painter, Bruce Kornbluth. This year marks the 25thanniversary of the Monhegan Residency program. Since its founding in 1989, the organization has sponsored the work 48 Maine artists including Marguerite Robichaux (1990), whose career was the subject of a retrospective at the Pucker Gallery in Boston in 2013; Joe Kievitt (1996) and Alina Gallo (2011), both of whom had work chosen for the 2013 Portland Museum of Art’s Biennial; and Cynthia Davis (2006), whose inventive “map-making” received critical praise last year in the pages of the Portland Press Herald during her solo exhibition at the Coleman Burke Gallery in Brunswick. This summer, the work of 34 former Monhegan Residency artists will be the focus of a special exhibition at Thos. Moser’s Freeport, Maine, showroom and gallery from June 19th through October 14th. The works on view at Thos. Moser reflect 25 years of an island residency program. FREEPORT — Back in the day, making art on Monhegan was a fairly simple proposition. Artists could rent a cottage for the summer, and many had the means to buy seasonal homes. But as the island became a destination for the wealthy and well-endowed, the costs associated with island life eclipsed what most artists could afford. For 25 years, the Monhegan Artists’ Residency has given artists the ability to live and work on the island, which sits about 12 miles off the Maine coast. This summer, Thos. Moser in Freeport hosts a 25-year retrospective of work by artists who have benefited from the residency program. For five weeks each summer and fall, two Maine artists are given the opportunity to live and work on the island. Recently, the residency also has awarded Maine art teachers a two-week stay. “Monhegan has been an artist colony for more than 100 years. It’s had this strong tradition, but it’s become financially out of reach for a lot of artists, particularly emerging and mid-career artists,” said Susan Danly, president of the Monhegan Artists’ Residency Corp., based in Lincolnville. It also keeps the art tradition alive on the island. Portland – Daniel Anselmi from Belfast and Kristin Fitzpatrick from Portland have been named the 2013 Monhegan Island artists-in-residence by the Monhegan Artists’ Residency Corporation. Thanks to a new initiative supported by the Maine Arts Commission, Melinda Campbell from Old Orchard Beach will take the first-ever art teacher residency offered by the program. Fitzpatrick, a recent graduate of the Maine College of Art printmaking department, will be on Monhegan June 1-July 5; Anselmi, an abstract painter, August 31-October 4; and Campbell, a teacher in the Auburn School Department, July 6-20. This year’s fellows will lodge in two new studio spaces, Elva’s Old P.O. and the Shumaker Cottage, both of which feature outdoor working spaces overlooking the island’s distinctive landscape. Jurors for the 2013 residencies were Suzette McAvoy, director, Center for Maine Contemporary Art; Charles Melcher, associate professor for Graphic Design, Maine College of Art; and Virginia Sassman Rose, director, Rose Contemporary Gallery in Portland. Noted Maine artists who have taken part in the Monhegan Artists Residency program include Marguerite Robichaux, Lynn Travis, and David Vickery, who will have a solo show at College of the Atlantic this summer. Two other past residents, Joe Kievitt and Alina Gallo, will be featured in the 2013 Portland Museum of Art Biennial. Now in its 23rd year, the Monhegan Artist’s Residency program is supported by individual donations and grants from the Quimby Family Foundation, the Lida P. Underhill Trust, and the Maine Arts Commission.